Voodoo doll and mojo hand DIY kits? I hope this is the right place to put in this request and see if anyone else feels the way I do. I tend to feel a certain amount of empowerment & I also feel as though more power is put into things I make myself. With that in mind, I would love to see LM sell baby doll kits and mojo hand kits, etc. I know they sell the final product(s), but I would love to be able to buy a kit to make these items myself, complete w/instructions, materials & variations/suggestions for materials to add for different desired effects. Anyone else feel the same as I or is this a stupid request/suggestion? Thank you St Florian for your protection! Re: Voodoo doll and mojo hand DIY kits? From the proprietor of the Lucky Mojo Curio Company comes the most thorough, complete, and authentic book on how roots and herbs are used in traditional African-American folk magic. 500 herbs, roots, minerals, and zoological curios are listed, along with their scientific names, so you will know exactly what to harvest or buy from an herb dealer. Included are an amazing 750 spells, formulas, mojo hand combinations, and candle rites, all given in workable, practical detail. Medical usages for many of the herbs, supplementary botanical notes, a series of cross-indexes listing herbs by the magical conditions for which they are recommended, plus 50 beautiful black and white illustrations of herbs and vintage herb packaging round out this informative reference volume. There is no other herb encyclopedia like this one. This is the book to get if you are working traditional conjure and herb magic. If you order from Lucky Mojo, cat will inscribe your copy to you. 224 pages. Thank you. I think I'll order the book asap! I am going to sign up for the correspondence course... yeah! I can't decide if i should get the paperback or the hardback version of Cat's book. Any suggestions would be greatly appreciated. If you can afford it, get the hardback. Since you will be referring to it constantly, it will last a lot longer than the paperback. I would advise the hardback as well. I am not yet in the course, but do know that my paperpack copy of HHRM is slowly slipping into "extremely used" condition. I plan on getting HC for both when I enroll. The two books -- HRCC and HHRM Hardcover -- have matching bindings, in different colours, in hardback. Kinda classy. I currently have the paperback version and it is showing signs of usage. My plan is to purchase the hardback for my permanent library, then I can guiltlessly indulge my bad habit of writing notes in the margins of my paperback copy. CopperFox wrote: I currently have the paperback version and it is showing signs of usage. My plan is to purchase the hardback for my permanent library, then I can guiltlessly indulge my bad habit of writing notes in the margins of my paperback copy. I agree with this 1000%! I ordered the hardback and I signed up for the course as well. I am quite excited. I have been feeling I had become stuck in my personal growth, so I think it will be a great tool for learning. I had thought to wait because we are living in an RV for a couple of years and I was worried about the demographics. I was wrong,though. People are coming and going and are so friendly. It is an even better opportunity to learn about folks cultures and backgrounds than normal. I vote Hardback, at the moment I've been using paperback but I'm going to get the hardcover, they last a lot longer and you will probably be using it quite often. It's an amazing resource. Mine is very dog-eared and well used...it's time for the hardcover! Yea, I wish I got the hardcover too Devi because I know I'll be using this book A LOT. I even took it to work today and was reading it during lunchtime. This book definitely helps on ordering LM products. everything just makes more sense now...can't wait to place a big LM order. I agree as well...I just love...love...love it.. I agree a fantastic book! this will continue to be my right hand book for many years to come. do you have some book of Hoodoo that you feel is the nr 1, i mean the best book of Hoodoo out there? do you know a Hoodoo writer that had read all the books out there about Hoodoo, voodoo, santeria etc in english, and had take all the most important information and had make a concentrate book about Hoodoo history, experiences, how Hoodoo works and its use, the relationship with the spirits etc? Well, since Voodoo and Santeria don't have anything to do with traditional hoodoo - having read those really wouldn't make much difference one way or the other. The best books are Miss Cat's information and books - one of which is available for free online. Can i buy some one in Hardcover or leather bound? I mean some one that is on paper, i don't like internet books! 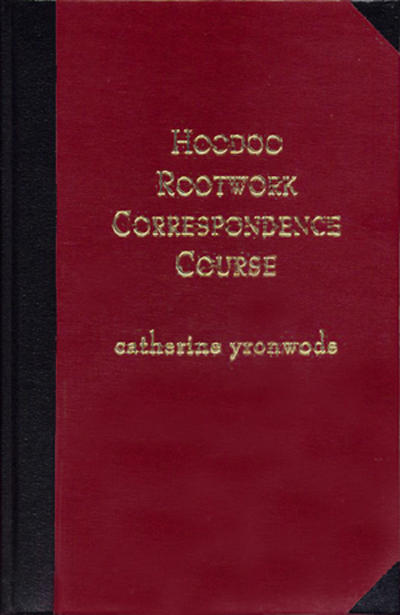 Cat's "Hoodoo In Theory and Practice" is only available online. 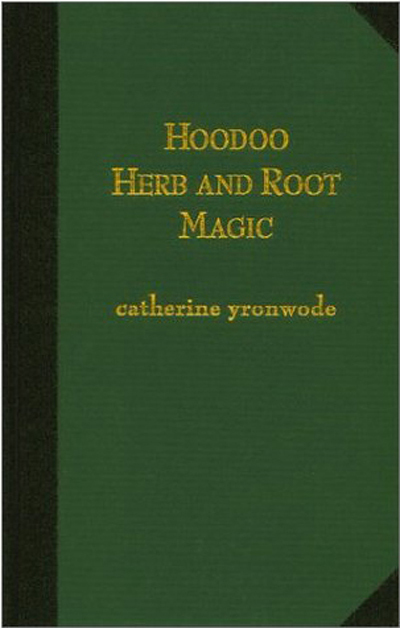 However her "Hoodoo Herb and Root Magic" book is available in either softcover or hardcover through Lucky Mojo. Confused about two books: Is HHRM the same as HITAP? I'm a newcomer to Root Magic and I'm looking for some good books. This has led me to Catherine Yronwode's "Hoodoo Herb and Root Magic". An Introduction to African-American Rootwork"
Are these two books the same thing only re-titled, or are they seperate (with the "HOODOO IN THEORY AND PRACTICE" being a still in-progress work)? Re: Confused about two books: Is HHRM the same as HITAP? Hi jwalke12 and welcome to the forum! "Hoodoo Herb and Root Magic" and "Hoodoo in Theory and Practice" are two separate books. I'm impressed with your choice to study and read! Good luck to you and Welcome again to the forum! I just want to say... this book is sooooo awesome!! really clear and concise, and the people in LM shipped my order so fast, I was expecting to wait at least a month but in 2 weeks I already have my copy. And a big THANK YOU to Miss Cat for taking her time and sending the book with her signature. When i first saw that it took two weeks for you to receive the book, i was shocked that it took so long -- but then i glanced over at your location, to the right side of your message -- and you are in South America! Hey! That's not bad at all! Glad you like the book. I absolutely LOVE Hoodoo in Theory and Practice, and refer to it often. And, I would like to read HHRM. Is there any chance of an ebook version being made? I would like an online version partly because I am "in the closet" with my spiritual side to most of my friends and folks who could potentially find it in my apt. It's easier to hide a computerized version of the book. Also, I tend to get a little oil on my bible and spell notebook, because sometimes I don't want to interrupt my "flow" between dressing the candle and reciting my prayers, and I don't want to get a new book all greasy lol. You can find read some of its information online at Herbs, Roots, Minerals, and Zoological Curios http://www.luckymojo.com/mojocatherbs.html. There is much more information in greater detail in the book. You can purchase the book, put a book cover on it, place it among your personal things or keep it in the truck of your car or your glove compartment. Hi, HHRM will not be published as an ebook because the rip-offs make it not worth it. Jwmclin had a great idea -- buy HHRM and put a cover on it! Oh- great idea! I forgot book covers existed. I don't think I have used one in about 20 years lol. I'll check it out. Thank you for the link and suggestions, and I understand completely about the ripoff aspect. I anxiously await the HHRM book I ordered. However, I do have a question. Are the free spells and such that are on the LM website included in the book? I was just curious. The "free spells" you are referring to are portions of a free online book called "Hoodoo in Theory and Practice." They are not published in print form at this time. Ok. Believe me, that information is more than enough. Thank you! The book is worth it's weight in gold, you will not be disappointed in the least. One of the most valuable books you could purchase for working our kind of practice. Good luck to you EavanStar! Any plans for a 10th anniversary edition next year? Anything to celebrate the 10th anniversary of the publication of Hoodoo Herb and Root Magic? I finally ordered Cat's "Hoodoo Herb and Root Magic" book and I have to say I am so happy I did - the book combined with what she has online has really opened my eyes - especially about our connection to nature. While I've always had a great respect for nature and all its glory - I found myself looking at the world a bit different this week - from the creek (down the street from work) to the trees springing back to life. It reminded me how inter-connected we all are nature/humans and why we ask the spirits of the herbs, water - etc. to help us in our work. I'm still learning and I've had some successes and some - well I wouldn't call them failures just things that didn't work for one reason or another - but reading the book has given me a lot of insight as to why some things didn't work. Thanks again, Cat, for sharing your wealth of information! I heart the book too!! <3 I can't put it down. CAT thank you for signing my book I just received it today its great! Thank you Cat for signing my book. I just have to share a funny story about what happened today when I rushed around and tried to cook up and test drive a concoction inspired by my new Hoodoo Herb & Root Magic book by Catherine Yronwode that arrived yesterday, but made with ingredients I had at hand. DH and I decided at the last minute to go to a Gospel Sing at a nearby town that was having a three-day festival. I slapped the book shut at the point where I was reading about money and luck herbs, ran in the kitchen, warmed some oil with cinnamon and cloves, splashed in some wintergreen liniment, dabbed my money and my hands and jumped in the car. All the way to town I was thinking, bring on the green, bring on the luck, keep my money safe. When we got to the event, my very frugal DH surprised me by buying me a treat. It was a quart-sized tin cup of icy root beer. The cup was bright green with a "lucky" leprechaun on it and you could get unlimited refills for a nominal fee. It was green, it was lucky and my money stayed in my purse! I just laughed and laughed! I can hardly wait to see what will happen with a little more forethought and preparation. Thank you to the Lucky Mojo staff for the expert packaging and speedy delivery of my book and for the sweet little surprise inside. --J. What a great sign! Thanks for sharing. I am IN LOVE with your book, at first i'll be honest and say I have qotten confused with knowinq the tricks, tips and the herbs, but I was very pleased with what I have fount. This is an ACTUAL book I'd love to read over and over aqain....my favorite are the LOVE, MONEY & PROTECTION tricks and herbs. I will INDEED try these tricks and thanks to you, & LM, I'm movinq out, have my own place, and I have a stable job. My next target, LOVE.....And I thank you. This is a work of genuine scholarship and will be very useful in saving a dying art. I am very impressed with it. I just got mine today in the mail. I have to say thank you so very, very much! I got the hardcover, and am very impressed. I do know that this will make my adventure into learning so very much easier. Thanks Cat for the time and effort you put into the book. It is very easy to understand, I was starting to feel a bit overwhelmed about my learning until I got my copy! And thanks a lot for your time to sign the book, that means a lot to me! This book has become absolutely priceless to me. It is dog-eared and very much loved. I carry it with me often, for on-the-go referencing. miss cat's book has helped me better my life and better the lives of my loved ones. It has helped me see my power and improve my works. I have used many of the spells in this book with wondrous results. I just used it this weekend to make a self love and power honey jar for myself. I am feeling powerful, energetic, happy, and like I can do anything!!!! Thank you miss cat and Lucky Mojo. My life has improved by leaps and bounds since I found you! Thanks, all for the kind words. Carolina Dean -- we just went back to press with the fifth edition (2011), and we will probably have enough of those on hand to carry us through the tenth year, so we have no plans for a 10th year edition. It's hard to believe it has been that long! just curious does the book have added and updated info each addition. I have the 3rd which I love and as mentioned prior use often and reference for everything. Great book, thanks Cat for your life long dedication to the craft! Thre are only minor typo corrections between the third, fourth, and fifth editions. The first, second, and third have the greatest differences. I recommend the third - fifth editions because they have more entries than the first or second editions, not to mention fewer typos! I LOVE the book! Last Christmas I told my husband that I wanted some books on Hoodoo. He bought me a few but they were largely Wicca 101 books with a smattering of supposed Hoodoo thrown in. So I did some research and found Cat's book and this website! Wow! The book is fantastic! I'm one of those people who needs to read a bit before I go to sleep each night. Cat's book has been on my bedside table since the day it arrived. I already read it from cover to cover once, and now I browse through it at random each night. It's alphabetical so it's easy to look up your favorite herbs and curios. I highly recommend this book. Just recieved my "Hoodoo Herb and Root Magic" book this week and I am already on my third round of reading it front to back. Absolutely love the book!!!!!!!! I could not have asked for a better read!! I love the book too, thank you to Miss Cat for the wonderful information you have in the book and the way you have laid it out. Makes for very easy understanding and learning. And lastly but not least...thanks for taking your time out your busy schedule to sign the book. I initially got into Hoodoo studying European Grimoires from Bibliotheque Bleue which was a French publishers company in 17th-19th centuries that supplied cheap almanacs, ephemerides, & grimoires. I noticed that after the spirit list the spells with them used certain materials that weren't European in origin like some herbs and woods, and also methods that seemed more African-American in origin perhaps. Leading me to Lucky Mojo via Catherine Yronwodes Hoodoo Herb and Root Magic book. It was my first looking into what you could've called down home magic. Very different to what I was into at the time. Before this i was more into Ceremonial magic & Hermetic Qabalah but in my teen years very much into books I recently found on here are a synthesis of a American forms of Wicca and Hoodoo in Lucky Mojo book list. I discovered Catherines book after reading upon other African - American traditions and folk religions and in the process brought the methods in spirit work, candle magic, magical baths, house washes, and mojo bags but with the grimoire spirits, like Solomonic talismans Hoodoos use only I've made a pact that the spirit has agreed and signed upon. So i put their names/characters on the petition paper which i fix with a combo of Lucky-Mojo oils, lodestone and feed magnetic sand with a repetition of the petition at various lunar phases to re-charge. But anyway I've got to use a combination of herbs available on here that aren't easy for me to grow or get, that have shown themselves to be effective either in bags, baths, or stuffed in vigil candles, with a combo of Lucky Mojo oils. Its something that is so naturally habitual like a bath or washing the floor, but with a psalm, magic oils, a candle flame, and incense burning - whatever. To going out cruising for guys and getting the perfect fitty to come running with oils rather than a body spray. Better still into an unscented body lotion. And its more handy for everyday life to spiritual affairs, a dose of medicine in whatever aspect of your life your seeking to change, adapt or improve. A lot of the High Magic stuff is too philosophical and internalised/psychological and omits the things which traditionally have always been associated with magic and that is the science of herbs and roots esoteric and medicinal and the intercession of spirits. Thanks for the testimonial! I'm glad you have found in my book a way to bridge the gap between ceremonial magic and folk magic! There are a few mentions of the most toxic plants, warning people not to ingest them, but this is not a medical book on herbology. There is no guarantee that you will be allergic or non-allergic to any plant in the worl, or in my book. You should consult your doctor for the treatment of allergies. I also would like to offer a testimonial for this wonderful book. I must admit I didn't initially purchase my first copy from Lucky Mojo BUT after ordering from the company, reading Hoodoo in Theory and practice online, and frequenting the forums I HAD to have the hardcover version (plus my paperback version was getting rough around the edges from usage lol). I still feel like there is an abundance of information to be had every time I open it. I love it! A welcome although unexpected side effect was an appreciation for plant life...I'm a city girl, born and raised, and I never really paid much attention to what little greenery there was around me. I am certainly more appreciative now (of course I live in AZ now lol...kinda dry and definitely less green, in my location anyway). I find myself consciously thinking more about my "footprint" so to speak, and how to be less wasteful. My mom sent me some roses for my birthday and I set a few of them aside to dry them and save the petals for later use. A phone conversation out of the blue, that led to my receiving this book that I will not allow to leave my side. What an amazing Lady Ms. Cat is, and this book is a MUST HAVE! Easy to follow, well written, packed full of info that newbie to the very experienced can use. I can now proudly say I own 2 copies. Just so it is never out of my reach.